Files cannot be copied to the FRITZ!Box's storage (NAS) although there is sufficient memory on the USB storage device connected to the FRITZ!Box. Not enough space on FRITZ.NAS (\\fritz.box). There is not enough space on the drive. The operation can't be completed because the drive is full. The files are being transferred to the main directory or a folder in the main directory of FRITZ.NAS (for example "images", "documents", "FRITZ"). These folders are located in the FRITZ!Box's internal memory, and there is not enough space available on it for the files you want to transfer. Note:Windows computers and some other devices display a higher storage capacity for FRITZ.NAS than is actually available. See our guide Incorrect storage capacity shown for USB storage device for further information. 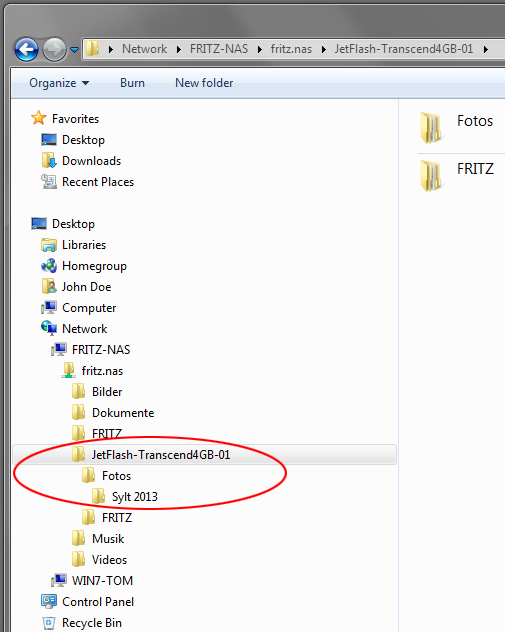 If you use the Windows Explorer or macOS Finder, open the network folder "FRITZ.NAS" and select the folder with the same name as the USB storage device. Copy the files to a folder on it (see fig.). If you are using a web browser, click on the folder with the same name as the USB storage device and copy the files to a folder on it (see fig. ).